The Tocker Infographics cannot be used without the express, written permission of the Tocker Foundation. 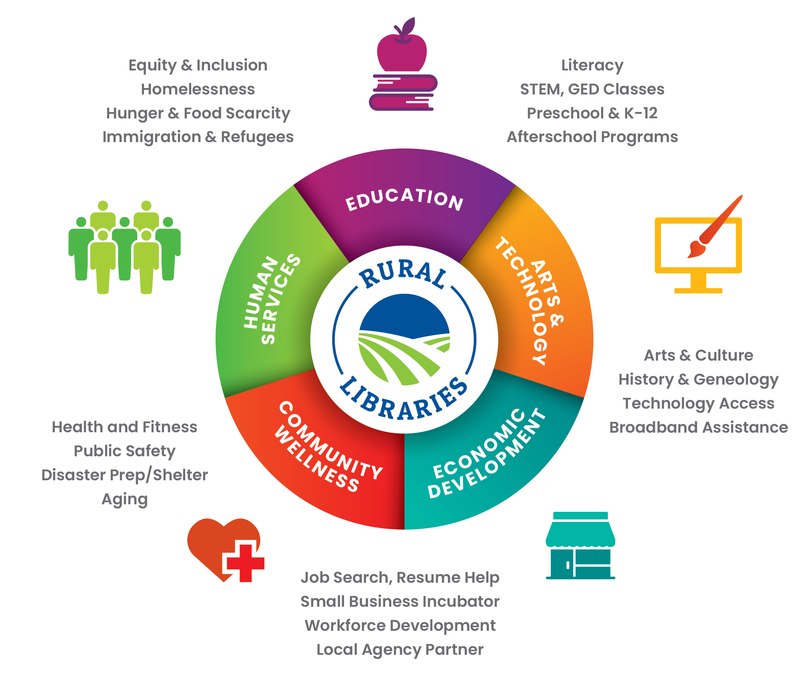 However, in furtherance of its mission to support rural libraries, the Tocker Foundation provides a simple, easy method for a library to obtain a free license to use the Tocker Infographics for the limited purpose of non-commercial promotion of the library, its services, or libraries generally. To agree to the following license on behalf of your library, simply fill out the form below and click “I agree.” You will be taken to a new page where you may click to download approved files of the Tocker Infographics as well as a copy of the license. If you have any questions about the license, please contact Karin Gerstenhaber. We want to be sure you understand the terms before you agree to them! We request this information to learn about the creative uses that librarians find for the graphic. You are not limited to the uses you describe here. ▸ How can I use the Tocker Infographics? Once your library agrees to the license, you may use the Infographics to promote your library and its services or libraries generally, in any medium (print, online, etc. ), but only if no one (including the library) is making money from those uses. ▸ What if I want to use the Tocker Infographics for fund-raising purposes? You must obtain additional written permission from the Tocker Foundation before using the Infographics for fund-raising purposes. Contact Karin Gerstenhaber. ▸ Can I modify the Tocker Infographics? You may convert the color images to black-and-white, but you may not modify or alter the Infographics in any other way. ▸ Can I share the Tocker Infographics with other libraries? You may not share the Infographics with anyone, other than to engage in uses allowed under the license. Each library must obtain its own license to use the Infographics. ▸ Do I have to give credit to the Tocker Foundation? The approved image files you download of the Infographics include a copyright notice that must appear with its use. You do not need to provide additional credit to the Tocker Foundation. The CFPB is working with libraries to provide websites, worksheets, guides and other information to help with a consumer's money decisions. The cost of the digital divide stands at $68 billion over 20 years, but electric co-ops are exploring and delivering solutions for rural broadband. The Small Library Resource Center just gets better every year. Don't miss @WebJunction and 8 other org's that serve small libraries!